In a building where corner properties are rarely available, Unit 8F at 3303 Water Street is an amazing two-story true penthouse. 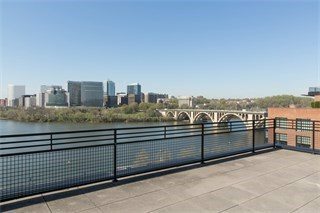 Richard Williams, award-winning architect, designed the newly renovated 4,000 square foot space to optimize the breathtaking 360-degree views of the Potomac River, Key Bridge, Arlington Skyline and the Georgetown Canal. 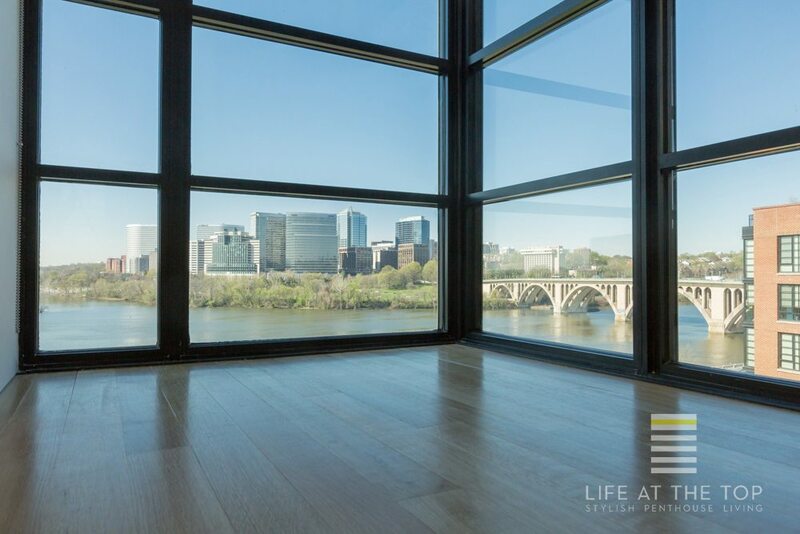 Enclosed by glass on three sides, the living room offers the most expansive river views. “We opened up the interior and organized it so the spaces could flow and slide into one another,” said Richard Williams. Just outside, a stunning private roof terrace provides an additional 3,200 square feet. Three bedrooms, three and one half baths and dramatic interior appointments abound at every turn in this 3303 Water Street masterpiece. The European custom-designed, open-plan kitchen includes professional grade stainless steel appliances, maple cabinetry and marble countertops. Baths feature deep-soaking tubs by Waterworks, marble floors, countertops and bath/shower surrounds, and frameless-glass shower doors. Built-ins and walls of closets provide storage keep clutter at bay. An “It” Building selection, the full-service building has a doorman, concierge, private gym and rooftop pool. Georgetown is unquestionably one of the most affluent neighborhoods in Washington and home to many of the city’s politicians and lobbyists. 3303 Water Street has a location with a 95 Walk Score. Everything you could need, want or crave is a few minutes’ casual stroll away.